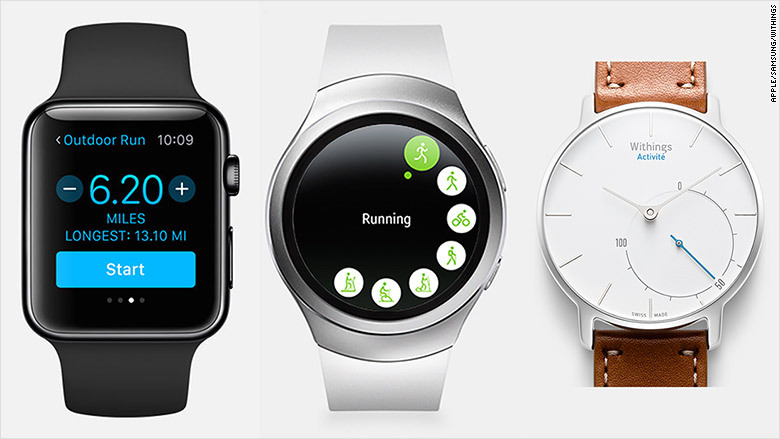 Are you thinking of buying a smartwatch for the holidays? There are dozens to choose from -- but most of them have identical features, and differ mainly in quality of materials, design, and cost. Before you decide which one to buy, figure out what you want most out of a smartwatch first, then focus on style and price. 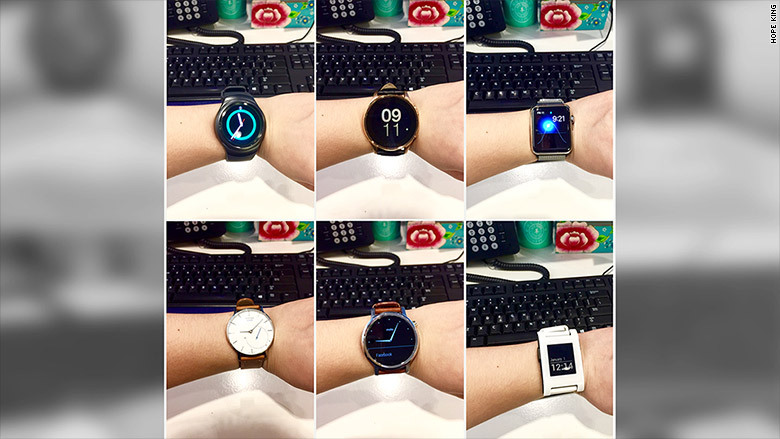 Over the past few months, I tested seven smartwatches back-to-back, for about two weeks each. 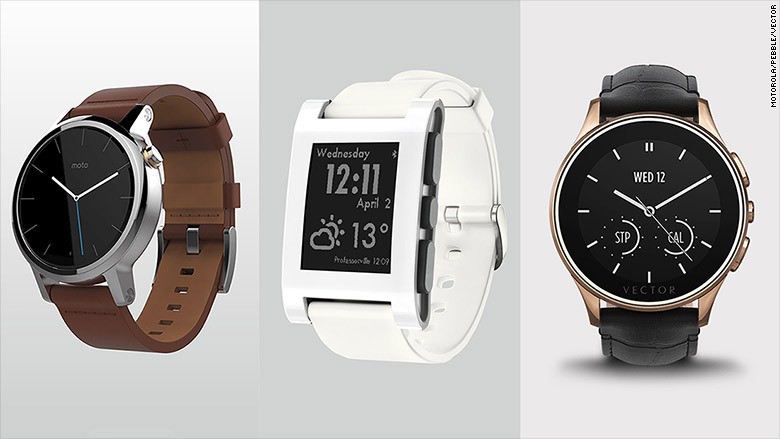 The Motorola 360, Pebble Classic, and Vector Luna are easy to use. 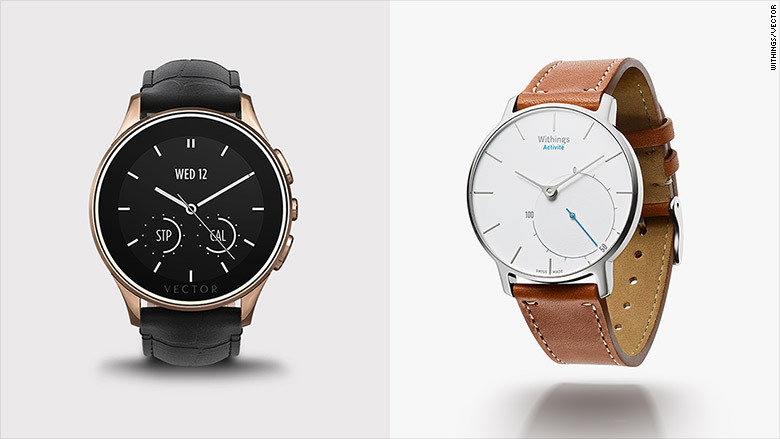 The Moto 360 ($300), Pebble Classic ($100), Pebble Time Steel ($250) and Vector Luna ($399) were easiest to use. Setup was a breeze, and I could keep track of the weather and Twitter (TWTR) -- the two things I check the most -- in two steps. Software for the Moto 360 was the best out of the four. Battery life was best on the Pebble Classic and Vector Luna mainly because of their e-paper and e-ink displays. The Apple Watch, Samsung Gear S2, and Withings Activité and Activité Pop all have fitness in mind. Both the Apple Watch ($350) and Samsung Gear S2 ($300) have applications that can track specific types of exercise, such as biking and elliptical machine workouts. The Withings Activité ($450), Activité Pop ($150), and Pebble Classic may be a great choice too for swimmers because they're water resistant up to 50 meters. The Apple Watch and Samsung Gear S2 can do a lot. 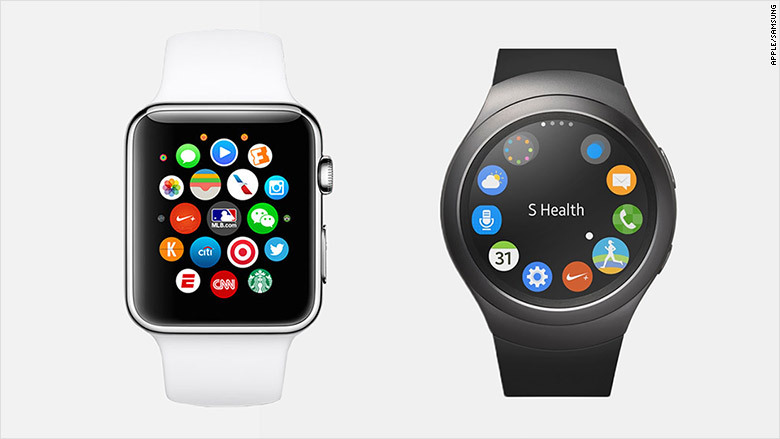 Get an Apple Watch or Samsung Gear S2. The Apple Watch can do pretty much anything an iPhone can do -- as long as the phone is within Bluetooth or Wi-Fi range. After you figure out the controls, the Apple Watch easily becomes another familiar device that will help you feel less anxious when you can't reach your phone every two seconds. The Samsung Gear S2 is fun and easy to use thanks to its rotating bezel. The touchscreen is responsive and bright. Samsung also sells a version of this watch with cellular connectivity, but I didn't get a chance to test that one. Currently, the watch only works with Android devices. The Vector Luna and Withings Activité both have very long battery lives so you don't have to worry about charging your smartwatch every day. The Withings Activité battery lasts eight months. The Vector Luna can run 30 days without charging. The Activité uses a standard CR2025 watch battery you can replace yourself, but the company "strongly" recommends professional care because the smartwatch is water resistant. The Vector Luna had the longest rechargeable battery life out of all the smartwatches I tried. The Activité watches only show the time, alarm, and a daily activity progress. I'm a watch lover. 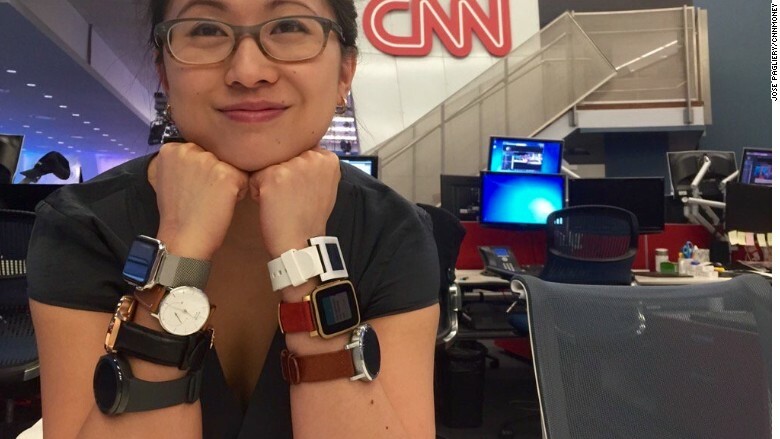 But I'm not completely sold on smartwatches just yet. -- While most of the devices helped me stay on top of notifications when my phone was out of reach, having to keep them charged, tethered, and close to my phone nearly outweighed the benefits of wearing them. -- Sometimes, fidgeting with my smartwatch felt like extra work and an extra step to using my phone. -- Smartwatches were most useful when I was doing housework, driving, walking around the city or office, and socializing. They were all waterproof to some extent and sturdy enough that I didn't have to worry about being delicate. -- The Samsung Gear S2 and Pebble Classic were my favorite smartwatches to wear. They were fun and easy to use, had good battery life, and performed enough of the functions I needed at a reasonable price. Overall, smartwatches are perfect for people who like to wear watches and want to be attached to a few of their favorite mobile apps constantly. If you don't fit this description, you might be better off waiting until more smartwatches can work independently of a phone and have better battery life.